Our Red Velvet Gourmet Gift Basket is the way to wish Happy Birthday to your family and friends in an elegant yet delicious way. 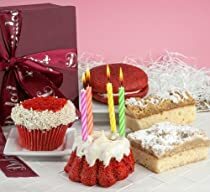 It features a red velvet bundt, red velvet cupcake, red velvet whoopee pie, and crumb cakes gift wrapped in our signature style. With a personal message from you, your recipient is sure to have a most wonderful day! !